Blackburn Rovers put another dent in QPR's automatic promotion hopes with a second successive Championship win to boost their own play-off hopes. Rudy Gestede gave the hosts the early advantage with a 20-yard shot into the bottom corner. Tommy Spurr doubled the lead with a low strike from inside the penalty area soon after the break. Rangers are now 13 points behind second-placed Burnley while Rovers are now just four points off the top six. With just five games of the season remaining, Harry Redknapp's team may now have to settle for the play-offs following successive losses and there is a possibility they could meet Gary Bowyer's men there too after Rovers extended their unbeaten run to seven games. Manchester United loanee Will Keane, whose brother Michael was in the Blackburn line-up, twice went close early on for the visitors but soon afterwards Gestede gave Rovers a lead they did not look like losing. The former Cardiff forward collected Tom Cairney's pass and took one touch before drilling a 25-yard shot beyond Rob Green for his seventh goal for the club. Former England goalkeeper Green's mistake three minutes into the second period proved costly for the visitors. Full-back Spurr edged into the area and fired a hopeful shot towards Green's near post and he allowed the ball to creep between his body and the woodwork. Keane struck a post late on for QPR, who introduced top scorer Austin as a second-half substitute following a lengthy absence through injury, but even his presence made no difference to the scoreline. "We've had some impressive halves and spells in games but for a complete 90 minutes we were excellent and the players deserve all the credit. "Everybody from start to finish, they were right at it and they were truly a credit to their football club tonight against a tough team. "The craziness of the Championship has got five games left so I'm sure it'll spin out loads of different permutations throughout them." "I think we probably thought that [automatic promotion] was going to be nigh on impossible for us before this evening. "Obviously we just want to go into the latter part of the season in as good form as we can and try to get a bit of momentum. "Everyone knows how important it is in the most important part of the season, and hopefully that will culminate in a play-off spot." 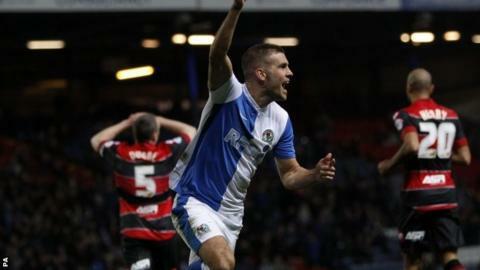 Match ends, Blackburn Rovers 2, Queens Park Rangers 0. Second Half ends, Blackburn Rovers 2, Queens Park Rangers 0. Offside, Blackburn Rovers. Jason Lowe tries a through ball, but Luke Varney is caught offside. Tom Cairney (Blackburn Rovers) wins a free kick on the right wing. Foul by Dickson Etuhu (Blackburn Rovers). Attempt missed. Luke Young (Queens Park Rangers) header from the centre of the box is too high. Assisted by Junior Hoilett with a cross following a corner. Corner, Queens Park Rangers. Conceded by Thomas Spurr. Attempt blocked. Modibo Maiga (Queens Park Rangers) left footed shot from outside the box is blocked. Assisted by Yossi Benayoun. Substitution, Blackburn Rovers. Dickson Etuhu replaces Lee Williamson. Offside, Queens Park Rangers. Modibo Maiga tries a through ball, but Charlie Austin is caught offside. Attempt missed. Richard Dunne (Queens Park Rangers) header from the centre of the box is too high. Assisted by Junior Hoilett with a cross following a corner. Corner, Blackburn Rovers. Conceded by Yun Suk-Young. Attempt missed. Luke Varney (Blackburn Rovers) right footed shot from the right side of the box is close, but misses to the left. Assisted by Tom Cairney with a through ball. Substitution, Queens Park Rangers. Yun Suk-Young replaces Benoit Assou-Ekotto. Substitution, Blackburn Rovers. Luke Varney replaces Rudy Gestede. Substitution, Blackburn Rovers. David Dunn replaces Jordan Rhodes. Attempt missed. Rudy Gestede (Blackburn Rovers) header from the centre of the box is just a bit too high. Assisted by Craig Conway with a cross following a corner. Corner, Blackburn Rovers. Conceded by Karl Henry. Attempt blocked. Jason Lowe (Blackburn Rovers) right footed shot from the right side of the box is blocked. Assisted by Rudy Gestede with a through ball. Substitution, Queens Park Rangers. Charlie Austin replaces William Keane. Substitution, Queens Park Rangers. Modibo Maiga replaces Tom Carroll. William Keane (Queens Park Rangers) hits the right post with a right footed shot from the centre of the box. Assisted by Junior Hoilett. Offside, Queens Park Rangers. Tom Carroll tries a through ball, but Junior Hoilett is caught offside. Corner, Blackburn Rovers. Conceded by Richard Dunne. Corner, Blackburn Rovers. Conceded by Danny Simpson. Foul by Danny Simpson (Queens Park Rangers). Jason Lowe (Blackburn Rovers) wins a free kick on the left wing. Attempt blocked. Jordan Rhodes (Blackburn Rovers) right footed shot from the right side of the box is blocked. Assisted by Rudy Gestede. Attempt saved. Craig Conway (Blackburn Rovers) left footed shot from the right side of the box is saved in the centre of the goal.